KABUL, Afghanistan A suicide bomber blew himself up outside a mosque filled with senior regional officials in northern Afghanistan on Friday, killing 41 people and wounding 56, government and hospital officials said. The attack in the town of Maymana, capital of northern Faryab province, came as people were gathering at the mosque to celebrate the Eid al-Adha holiday, said Jawid Didar, spokesman for the governor's office. There was no immediate claim of responsibility for the suicide bombing outside the mosque. A police source in the province said that the death toll could go higher because many of those injured are in critical condition, CBS News' Fazul Rahim reports from Afghanistan. The bomber struck after top provincial officials, including the governor and the police chief, who had assembled inside the mosque. The blast went off in the middle of a large crowd that included police and soldiers waiting for the dignitaries to reemerge. Nobody inside the mosque was injured, but the casualties included police officers and soldiers, Governor Abdul Satar Barez said. "There was blood and dead bodies everywhere," said Khaled, a doctor who happened to be in the mosque at the time of the blast. "It was a massacre," said Khaled, who like many Afghans uses only one name. Video from the scene showed the motionless bodies of several soldiers and policemen lying next to their vehicles parked on a tree-lined avenue of the city, located about 300 miles northwest of Kabul. On the sidewalk, a number of civilians lay along the mosque's outer wall, some writhing and moaning in pain. 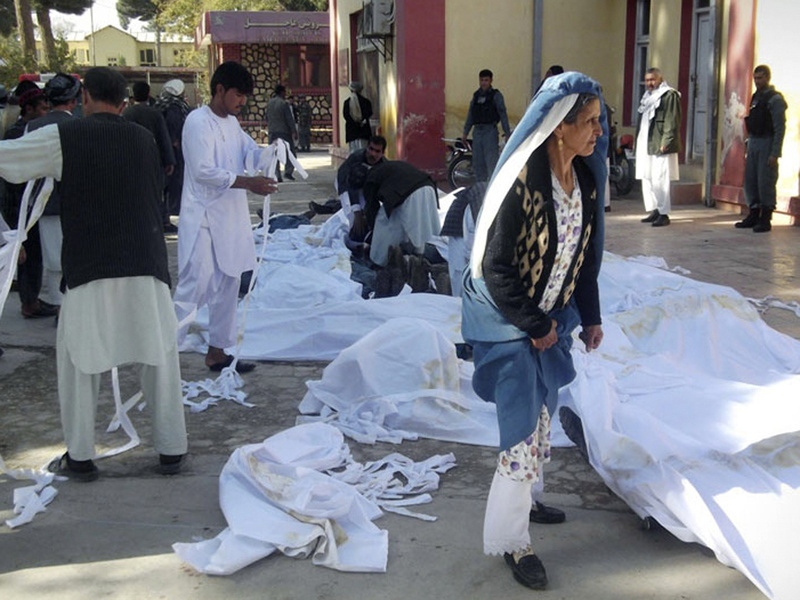 At least 14 civilians were among the dead, just two days after Taliban leader Mullah Mohammad Omar urged his fighters to "pay full attention to the prevention of civilian casualties" because he said the enemy was trying to blame them on the insurgents. It appeared to be the deadliest suicide attack in recent months. The attacks on Afghan officials indicate that the Taliban are trying to exploit NATO plans to withdraw its roughly 100,000 troops from the country by the end of 2014, leaving security in the hands of the 352,000-strong Afghan army and police. There are serious questions about the ability of the newly trained security forces to combat the insurgency, which even the U.S.-led coalition has not been able to stamp out. At the same time, the spate of so-called insider attacks has undermined trust between international troops and Afghan army and police, further weakened public support for the war in NATO countries and increased calls for earlier withdrawals. Deaths of Afghan police and soldiers are higher this year than last year, according army spokesman Gen. Mohammad Zaher Azimi. Although the Taliban have claimed responsibility for a parallel sharp increase in attacks by Afghan servicemen on their foreign colleagues, the overall number of coalition deaths has been noticeably lower than last year. Friday's attack came as Afghan President Hamid Karzai urged Taliban insurgents "to stop killing other Afghans" and to "stop the destruction of our mosques, hospitals and schools." Later, Karzai issued a statement saying those who carried out Friday's attack were "enemies of Islam and humanity." The NATO-led coalition's commander, U.S. Gen. John R. Allen, also condemned the attack. "This violence undertaken at a place of worship, and during Eid, once again shows the insurgency's callous hypocrisy and disregard for religion and faith," Allen said in a statement. The deadliest such attack took place last December in Kabul, with 56 Shiite Muslim worshippers killed and 160 wounded. Lashkar-e-Jhangvi, a Pakistan-based Sunni Muslim group, claimed responsibility. Also on Friday, the Taliban claimed responsibility for killing two American service members in southern Uruzgan province, in what may have been the latest insider attack against Western troops. In an emailed statement, Taliban spokesman Jusuf Ahmadi said a member of the Afghan security forces shot the two men the day before, then escaped to join the insurgents. Maj. Lori Hodge, spokeswoman for U.S. forces in Afghanistan, said on Thursday that authorities were trying to determine whether the attacker was a member of the Afghan security forces or an insurgent who donned a government uniform.